In today’s FIFTH post (I think this is a record!) 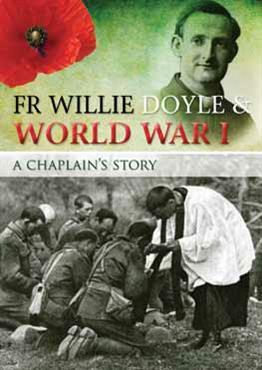 Fr Doyle recounts a touching scene in which a soldier shows him his gratitude. One of my men, belonging to the Irish Rifles, of which I have charge also, passed by. We chatted for a few minutes and then he went on, but came back shortly with a steaming bowl of coffee which he had bought for me. 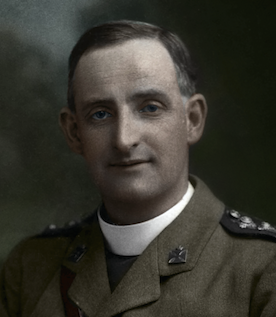 ‘ I am not one of your flock, Father,’ he said, ‘ but we have all a great liking for you.’ And then he added: ‘If all the officers treated us as you do, our lives would be different.’ I was greatly touched by the poor lad’s thoughtfulness, and impressed by what he said: a kind word often goes further than one thinks, and one loses nothing by remembering that even soldiers are human beings and have feelings like anyone else. 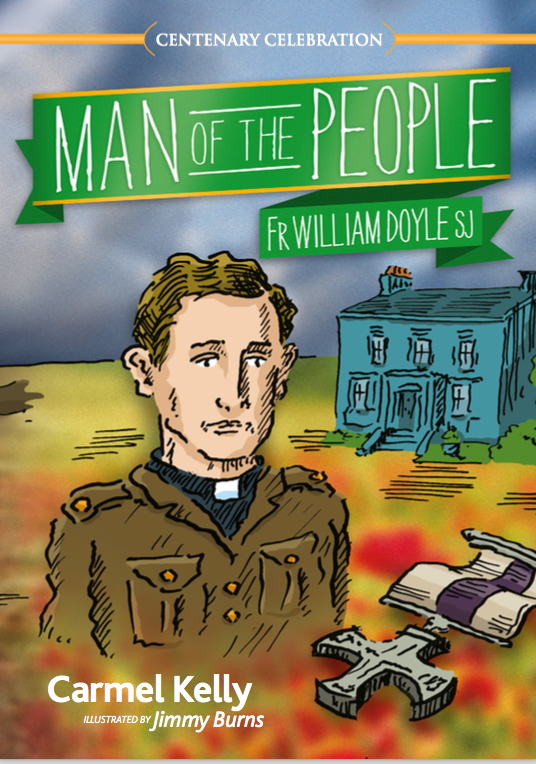 In today’s 4th post Fr Doyle presents a “typical” scene to his father. It is unclear if this is an historical record of an specific incident or an amalgamation of several different events to present his father with an insight into his typical activities. 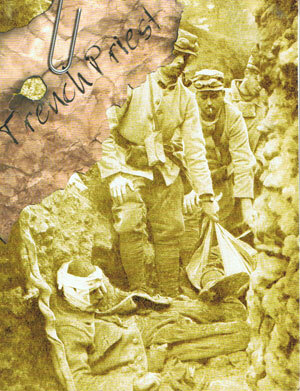 A poor wounded fellow lies on a stretcher with death already stamped on his face. The bearers lay their burden gently down—these rough men have the tender heart of a woman for the wounded—reverently uncover their heads and with draw a little as the priest kneels behind the dying man’s head. A glance at the identity-disc on his wrist, stamped with his name, regiment, and religion, shows that he is a Catholic—for there are few men, no matter what their belief, who do not carry a rosary or a Catholic medal round their necks. I wonder what the non-Catholic Padres think of this fearful increase of Idolatry ! ‘Ah, Father, is that you ? Thanks be to God for His goodness in sending you; my heart was sore to die without the priest. Father—the voice was weak and came in gasps—Father, oh, I am glad now, I always tried to live a good life, it makes death so easy.’ The Rites of the Church were quickly administered though it was hard to find a sound spot on that poor smashed face for the Holy Oils, and my hands were covered with his blood. The moaning stopped; I have noticed that a score of times, as if the very touch of the anointing brought relief. I pressed the crucifix to his lips as he murmured after me: ‘My Jesus mercy,’ and then as I gave him the Last Blessing his head fell back, and the loving arms of Jesus were pressing to His Sacred Heart the soul of another of His friends, who I trust will not forget, amid the joys of Heaven, him who was sent across his path to help him in his last moments. It is little things like this which help one over the hard days and sweeten a life which has little in it naturally attractive. If you had come up the trench with me twelve months ago on the morning of the gas attack and watched that same scene repeated hour after hour, I think you would have thanked God for the big share you have in the salvation of so many souls. In this excerpt from a long letter written 100 years ago today to his father, Fr Doyle writes about his publications on vocations. I soon found out that the shortest way to get a thing done is to do it yourself … I remember well when the manuscript had passed the censors to my great surprise, the venerable manager of the Messenger Office began shaking his head over the prospect of its selling, for as he said with truth, ‘It is a subject which appeals to a limited few’. He decided to print five thousand, and hinted I might buy them all myself ! I have been profoundly stirred in recent months by the experience of a young Roman Catholic saint, a member of the Society of Jesus, a tremendous lover of Jesus, a tremendous soul-winner, a great human and a great humorist. 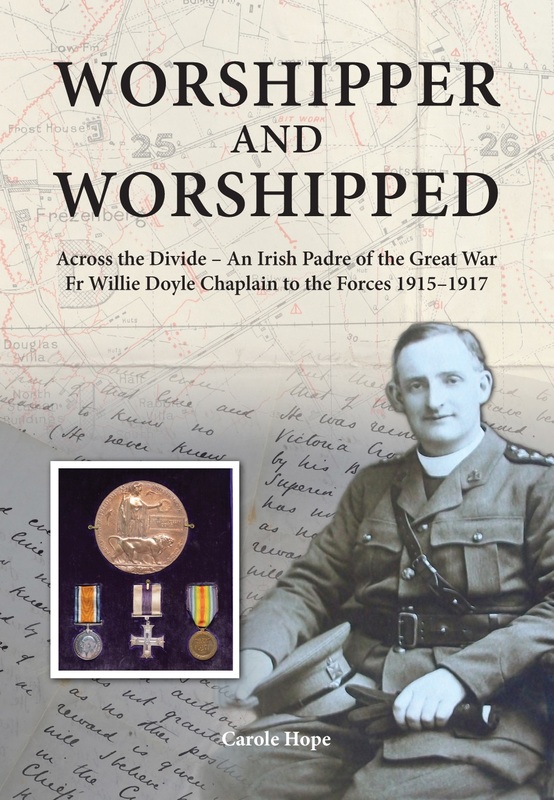 He had presumably been reading an early edition of the O’Rahilly biography and was deeply impressed at Fr Doyle’s example. Of course, in referring to Fr Doyle was a saint he was using the term in a popular and unofficial manner. This quote, from a non-Catholic clergyman, is just one of innumerable examples of how Fr Doyle’s admirable holiness and humanity have inspired people from all sorts of backgrounds and philosophies. 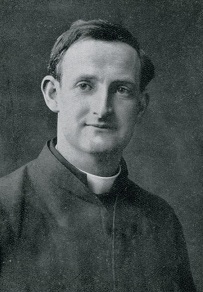 Fr Doyle was all things to all men – almost everyone can find something appealing and attractive about him once they study his life and spirit with an open mind. You ask how to pray well. The answer is, Pray often, in season and out of season, against yourself, in spite of yourself. There is no other way. 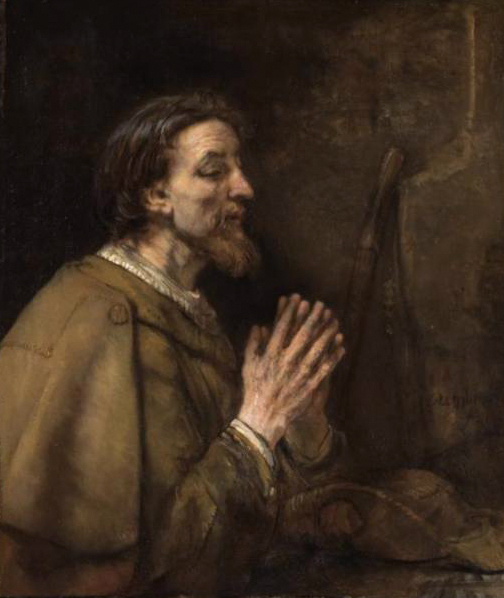 What a man of prayer St. James, the Apostle must have been since his knees became like those of a camel! When shall we religious realize the power for good that prayer, constant, unflagging prayer, puts into our hands Did it ever strike you that when our Lord pointed out the ”fields white for the harvest”, He did not urge His Apostle to go and reap it, but to pray? COMMENT: One thing really jumps out from Fr Doyle’s comment today – “there is no other way” for us than to pray. This doesn’t mean that we don’t work, or use our human talents, but that there is no other way for us to be successful in the use of these gifts than to pray and beg for God’s grace. If we are not united to God, no matter what activism we may be engaged in, we will achieve little or nothing. The reference Fr Doyle makes to St James is of note as today is his feast day, and it is an especially important day in Spain, so greetings to the Spanish visitors to the site. St James’ knees are reputed to have become as hard as camel’s from his many hours of kneeling in prayer. Whether they did in fact become calloused in this way is of course not hugely important, what matters is the example of this great Apostle in relying on God’s grace in prayer for his work. We shall have desperate fighting soon but I have not the least fear, on the contrary a great joy in the thought that I shall be able to make a real offering of my life to God, even if He does not think that poor life worth taking. 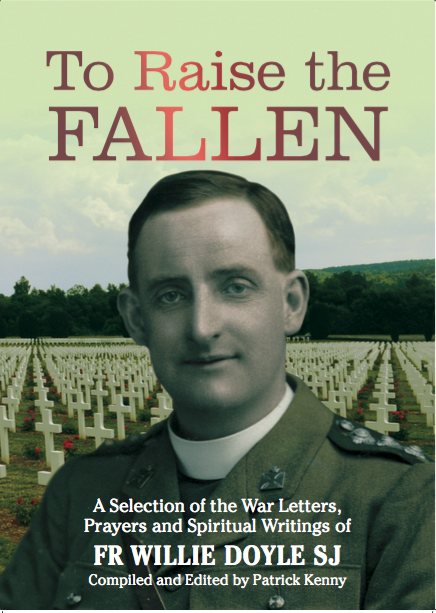 Over the coming couple of weeks, as we approach the 101st anniversary of that date on which God accepted the offering of Fr Doyle’s life, we will recount details of that “desperate fighting” and remember Fr Doyle’s steadfastness and dedication to duty under fire.